On May 20th at the Copperbox Arena in London, Floyd Mayweather’s protege and IBF World Super Featherweight Champion Gervonta Davis defends his crown against number one contender Britain’s Liam Walsh. Davis, known as simply ‘The Tank’ for his brutal knockout power, spectacularly announced himself as boxing’s next superstar with an unforgettable seventh round stoppage win over former Champion Jose Pedraza in January and is relishing making the first defense of his crown on foreign soil. 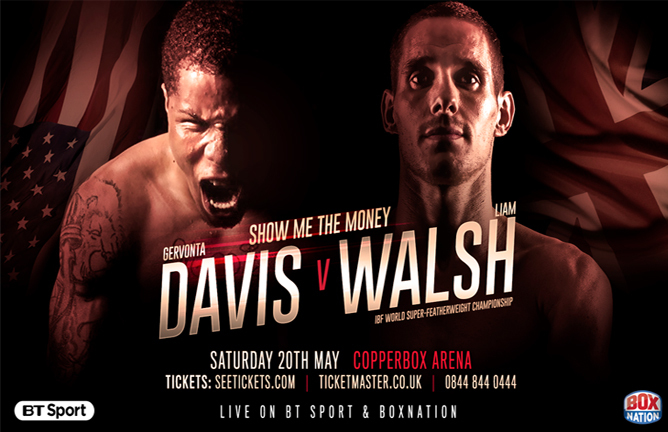 On May 20th at the Copperbox Arena in London Davis defends against Walsh. Two undefeated fighters will put it all on the line in front of an onlooking Floyd Mayweather. Is Gervonta Davis boxing’s next big star? Or can Liam Walsh finally realise his destiny and become a World Champion? This is not one to be missed.